This States of Siege™ game puts you squarely in command of desperate defense. As events unfold and heroes emerge, can you build up the barricades and fill the breaches before the camp is overrun? 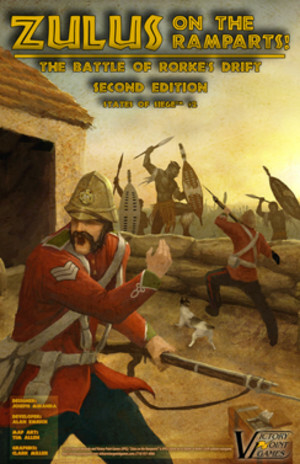 As the Zulus relentlessly charge wielding their deadly spears and as British rifles overheat, can you keep cool and make the command decisions necessary to hold your position and repel the onrush of fierce braves until the Relief Column arrives? The Battle of Rorke’s Drift saw more Victoria Crosses awarded than any other before or since. Can you write an equally glorious page in history as you confront these Zulus on the Ramparts! ?